...To Know What You Need To Know About Our Company!" The www.iMMACC.com Web Site (the "Site") is an online information service provided by the Internet Marketing Mentoring And Coaching Center (a division of ConAsia Global Internet Inc.). Your use of the www.iMMACC.com web site is subject to your compliance with the terms and conditions set forth below. Please read this document carefully before accessing or using the site. By accessing or using the site, you agree to be bound by the terms and conditions set forth below. If you do not wish to be bound by these terms and conditions, you may not access or use the site. Conasia Global Internet Inc. (DBA iMMACC.com) may modify this agreement at any time, and such modifications shall be effective immediately upon posting of the modified agreement on the site. You agree to review the agreement periodically to be aware of such modifications and your continued access or use of the site shall be deemed your conclusive acceptance of the modified agreement. The entire contents of the Site are protected by international copyright and trademark laws. The owners of the copyrights and trademarks are www.iMMACC.com, its members or other third party licensors. YOU MAY NOT MODIFY, COPY, REPRODUCE, REPUBLISH, UPLOAD, POST, TRANSMIT, OR DISTRIBUTE, IN ANY MANNER, THE MATERIAL ON THE SITE, INCLUDING TEXT, GRAPHICS, CODE AND/OR SOFTWARE. You may print and download portions of material from the different areas of the Site solely for your own non-commercial use provided that you agree not to change or delete any copyright or proprietary notices from the materials. You agree to grant to www.iMMACC.com a non-exclusive, royalty-free, worldwide, perpetual license, with the right to sub-license, to reproduce, distribute, transmit, create derivative works of, publicly display and publicly perform any materials and other information (including, without limitation, ideas contained therein for new or improved products and services) you submit to any public areas of the Site (such as bulletin boards, forums and newsgroups) or by email to www.iMMACC.com by all means and in any media now known or hereafter developed. You also grant to www.iMMACC.com and the Internet Marketing Mentoring And Coaching Center (a division of ConAsia Global Internet Inc.) the right to use your name in connection with the submitted materials and other information as well as in connection with all advertising, marketing and promotional material related thereto. You agree that you shall have no recourse against www.iMMACC.com or the Internet Marketing Mentoring And Coaching Center (a division of ConAsia Global Internet Inc.) or any company representatives or officers for any alleged or actual infringement or misappropriation of any proprietary right in your communications to www.iMMACC.com. Publications, products, content or services referenced herein or on the Site are the exclusive trademarks or service marks of www.iMMACC.com and the Internet Marketing Mentoring And Coaching Center (a division of ConAsia Global Internet Inc.). www.Big­TicketToWealth.com is also an exclusive trademark of ConAsia Global Internet Inc. Other product and company names mentioned in the Site may be the trademarks of their respective owners. "This website is owned and operated by (YOUR NAME) who is an independent affiliate with iMMACC.com." "The views and/or comments displayed on this site have not been approved or endorsed by iMMACC.com." These steps are necessary to protect the company from any statements or comments that have been made online regarding the company. It has come to our attention that some individuals are either intentionally or unintentionally misrepresenting their webpages as official company sites. In addition, if you have a fan page or blog that represents them as an iMMACC spokesperson, we ask that you either immediately turn those domains over to us, or that you rename them immediately. Social Media entities like Facebook and YouTube, etc. clearly state that you may not misrepresent yourself as an official of the company unless you have the express permission of the business owner. For example: iMMACC fan page, iMMACC blog, Internet Marketing Mentoring and/& Coaching Center fan page, Internet Marketing Mentoring and/& Coaching Center Blog, etc. If you have questions, please immediately contact the company. Failure to comply with these policies will result in the termination of a member's account. Under no circumstances can you use SPAM techniques to promote iMMACC mentoring program products. Absolutely NO EMAIL SPAM. Email lists MUST be opt-in. No exceptions. Absolutely NO Twitter Spam. Use BEST PRACTICES when using Twitter to promote. Absolutely NO Facebook Spam. Same goes here. In fact, NO SPAM AT ALL in any Social Media, Social Networking, or Social Bookmarking Sites. You will include Affiliate Disclaimers, as per the FTC Advertising Guidelines. Be transparent and authentic: We will treat your visitors with massive respect and give them value during their time with our mentoring program. Keep ALL internal promotional information confidential. If you leak info, you're OUT. No exceptions! You understand that, except for information, products or services clearly identified as being supplied by www.iMMACC.com, www.iMMACC.com does not operate, control or endorse any information, products or services on the Internet in any way. Except for www.iMMACC.com identified information, products or services, all information, products and services offered through the Site or on the Internet generally are offered by third parties that are not affiliated with www.iMMACC.com. You also understand that www.iMMACC.com cannot and does not guarantee or warrant that files available for downloading through the Site will be free of infection or viruses, worms, Trojan horses or other code that manifest contaminating or destructive properties. You are responsible for implementing sufficient procedures and checkpoints to satisfy your particular requirements for accuracy of data input and output, and for maintaining a means external to the Site for the reconstruction of any lost data. You assume total responsibility and risk for your use of the site and the internet. Conasia Global Internet Inc provides the site and related information "as is" and does not make any express or implied warranties, representations or endorsements whatsoever (including without limitation warranties of title or non-infringement, or the implied warranties of merchantability or fitness for a particular purpose) with regard to the service, any merchandise information or service provided through the service or on the internet generally, and www.iMMACC.com and the Internet Marketing Mentoring And Coaching Center (a division of ConAsia Global Internet Inc.) shall not be liable for any cost or damage arising either directly or indirectly from any such transaction. It is solely your responsibility to evaluate the accuracy, completeness and usefulness of all opinions, advice, services, merchandise and other information provided through the service or on the internet generally. www.iMMACC.com and the Internet Marketing Mentoring And Coaching Center (a division of ConAsia Global Internet Inc.) does not warrant that the service will be uninterrupted or error-free or that defects in the service will be corrected. You understand further that the pure nature of the internet contains unedited materials some of which are sexually explicit or may be offensive to you. Your access to such materials is at your risk. www.iMMACC.com and the Internet Marketing Mentoring And Coaching Center (a division of ConAsia Global Internet Inc.) has no control over and accepts no responsibility whatsoever for such materials. In no event will www.iMMACC.com and the Internet Marketing Mentoring And Coaching Center (a division of ConAsia Global Internet Inc.) Be liable for (i) any incidental, consequential, or indirect damages (including, but not limited to, damages for loss of profits, business interruption, loss of programs or information, and the like) arising out of the use of or inability to use the service, or any information, or transactions provided on the service, or downloaded from the service, or any delay of such information or service. Even if www.iMMACC.com or its authorized representatives have been advised of the possibility of such damages, or (ii) any claim attributable to errors, omissions, or other inaccuracies in the service and/or materials or information downloaded through the service. Because some states or provinces do not allow the exclusion or limitation of liability for consequential or incidental damages, the above limitation may not apply to you. In such states or provinces, www.iMMACC.com liability is limited to the greatest extent permitted by law. www.iMMACC.com makes no representations whatsoever about any other web site which you may access through this one or which may link to this Site. 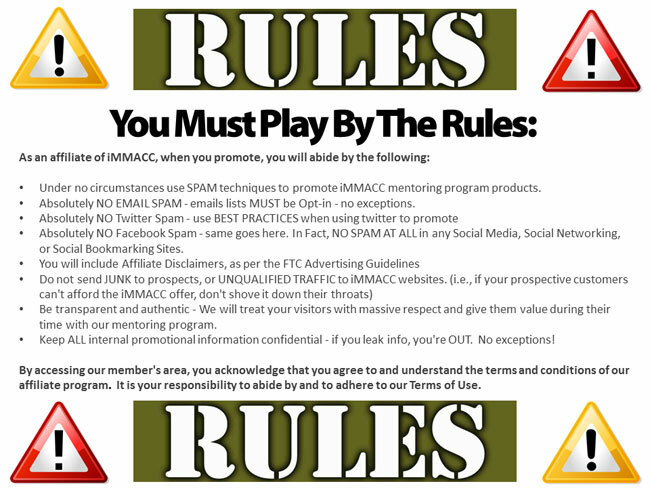 When you access a non-www.iMMACC.com web site, please understand that it is independent from www.iMMACC.com, and that www.iMMACC.com has no control over the content on that web site. In addition, a link to a www.iMMACC.com web site does not mean that www.iMMACC.com endorses or accepts any responsibility for the content, or the use, of such web site. You agree to indemnify, defend and hold harmless www.iMMACC.com, its officers, directors, employees, agents, licensors, suppliers and any third party information providers to the Service from and against all losses, expenses, damages and costs, including reasonable attorneys' fees, resulting from any violation of this Agreement (including negligent or wrongful conduct) by you or any other person accessing the Service. The provisions of paragraphs 2 (Use of the Service), and 4 (Indemnification) are for the benefit of www.iMMACC.com and its officers, directors, employees, agents, licensors, suppliers, and any third party information providers to the Service. Each of these individuals or entities shall have the right to assert and enforce those provisions directly against you on its own behalf. iMMACC.com markets a mentoring program and gives away an affiliate referral business for free. While each member is allowed to participate in any other legal business opportunity they wish, any member who publicly advertises in a negative manner against iMMACC.com, Conasia Global Internet Inc, or Gerald Van Yerxa will immediately forfeit 100% of their rights to membership. This Agreement shall all be governed and construed in accordance with the laws of Canada applicable to agreements made and to be performed in country of Canada. You agree that any legal action or proceeding between www.iMMACC.com and you for any purpose concerning this Agreement or the parties' obligations hereunder shall be brought exclusively in a federal or provincial court of competent jurisdiction sitting in the country of Canada. Any cause of action or claim you may have with respect to the Service must be commenced within one (1) year after the claim or cause of action arises or such claim or cause of action is barred. www.iMMACC.com's failure to insist upon or enforce strict performance of any provision of this Agreement shall not be construed as a waiver of any provision or right. Neither the course of conduct between the parties nor trade practice shall act to modify any provision of this Agreement. www.iMMACC.com may assign its rights and duties under this Agreement to any party at any time without notice to you. 7. Money Back -- There Are No Refunds. www.iMMACC.com enforces a strict no product discounting policy. www.iMMACC.com offers to the general public a product called 'the Internet Marketing Mentoring And Coaching Center Mentoring Program Membership' which is sold at a minimum retail price point of $2,297.00 US Dollars for the one payment option, or $2,797.00 US Dollars for the 3 payment option, or $3,797.00 US Dollars for the 6 payment option, or $4,997.00 US Dollars for the 12 payment option. Under no conditions will www.iMMACC.com tolerate price discounting of the 'the Internet Marketing Mentoring And Coaching Center Mentoring Program Membership' below the minimum retail prices stated above. 9. Sponsoring Issues & Affiliate Switching. iMMACC.com has been created and provides for the ability of any person to create their own success while not relying on their sponsor. The company teaches all members how to market online marketing virtually any product or service. Testimonials shared on this site are from mentoring program students who have created their own success as a result of previous internet experience and/or using and applying the iMMACC.com mentoring program product. If you choose to move or change to a different sponsoring member you will need to pay any and all fees associated with signing up as a new direct member to the new sponsor. These fees may include but are not limited to the hosting fee, any sales requirements or product purchases and admin fees. Prospective members are free to register under any member they choose. After that, there is absolutely no sponsor switching allowed except in extreme circumstances and, if allowed, will be at the sole discretion of the iMMACC.com management. No discussion or appeal will be entered into regarding this issue once management has made it's decision. Any sponsor switching must be approved in writing by the company. Signing up multiple positions (more than one position) in an attempt to receive both the direct sales product referral commission (from the sale of a Total Marketing Program product pack) and the matching commission product sales override (from a Total Marketing Program product pack) is not permitted. No member may have more than one iMMACC.com Total Marketing Program product pack per household. That position may be either a company, or an individual person. Any member found to violate this fundamental term will face termination and forfeiture of their position and right to commissions. Members may voluntarily cancel this Agreement and their Member Affiliate Membership at any time by mailing written notice via independent registered mail, return receipt requested, to the Company's corporate offices, the address of which shall be provided to said Affiliate solely for such purposes upon demand. The Company reserves the right to suspend or terminate an affiliate member at any time based upon illegal or unethical business practices of the Affiliate as so deemed solely by www.iMMACC.com. Members may not, under any circumstances, advertise or promote the www.iMMACC.com mentoring program product or the free independent member affiliate referral program as an investment. The only program the company sells is a mentoring program; the international affiliate referral business is available for free to all of our existing product users. Members in violation of this policy face severe disciplinary action including a minimum 30 day suspension or full termination with complete forfeiture of position and rights to collect mentoring program product referral commissions. The www.iMMACC.com only offers a product purchase of internet marketing mentoring products, marketing & mentoring systems, and marketing tools to prospective affiliate members. A further administration licensing & subscription fee of $99.97 US dollars per month is required which covers the the ongoing hosting costs of 99 landing pages for each member, as well as the member's live mentoring sessions and the introduction of new marketing seminars to each member's back office on a monthly basis. The monthly administration licensing & subscription fee is not refundable under any circumstances. The first installment must be paid on or before the thirtieth day after registration. Thereafter, the fee is due and payable every thirty days from the thirtieth day after registration. In the case of a new member registration, the fee becomes due on the thirtieth day after you register with the company. It doesn't matter on what day of the month you register, your first thirty days are included. In the event a member defaults on the monthly fee, they will be sent one notice via their email address that they are in default and that they are required to make payment. If payment is not made within the stated grace period (not to exceed 21 days), they will forfeit their complete organization and rights to commission. Effective March 1, 2008, the $99.97 monthly fee also gives active members the ability to download travel certificates on an ongoing basis as per the level of their membership. The monthly fees will also give each member the ability to have their own online product store as long as their monthly fees are kept current. The fees include the hosting of the active member's online product store. Each member is responsible for securing their own merchant account for their online store. The online store is automatically included in each members purchase and may not be deducted from the monthly fee even if a member chooses not to use their store. A portion of each member's monthly fee is used to pay for the creation of new marketing seminars that the company produces on a monthly basis for its members. Members must keep their monthly fee active in order to have access to these products on an ongoing basis. Portions of these monthly fees are used to update, add and replenish the marketing seminars that iMMACC.com produces from month to month. Any member may choose to put their membership on hold for an indefinite period of time; however, payment of the monthly fees is necessary to access the private member's only area of the back office which contains access to all training, all product downloads, etc. Members who have put their accounts on hold can regain access to the private member's area by re-instating their $99.97 monthly fees. Under the old Big Ticket To Wealth Program, National Members have access to 1/3 of the travel; Executive Members have access to 2/3 of the travel; Presidential Members have access to all of our featured travel. Effective September 7, 2010 under the new iMMACC Total Marketing Program, all new members will have access up to $10,000 (ten thousand dollars) of travel vouchers. The company has sole discretion in terms of the types of travel certificates being made available to its members. Note: the types of travel certificates can and do change from time to time depending on what is available from the travel providers. The company pays monthly fees to secure this travel on an ongoing basis, and a portion of each member's monthly fee goes towards paying for that company expense. The travel will remain available for as long as the company is able to secure it. Members understand & accept that www.iMMACC.com members shall under no circumstances solicit, promote or market any other product, service or business opportunity, directly or indirectly to any other www.iMMACC.com member who is not personally sponsored by that member unless having a prior approval in writing from www.iMMACC.com. Members understand and accept that they will not make false or misleading statements about www.iMMACC.com members or the www.iMMACC.com Member Affiliate Services, Benefits, or Compensation Plans. Display of earnings statements and the making of income projections to prospective www.iMMACC.com members are illegal and are strictly forbidden. Income disclaimers must be used at all times when referencing earnings potential with the iMMACC.com mentoring program products. Statements made by any member that promotes any type of income projection or guarantee of earnings are strictly forbidden and are cause for immediate termination & dismissal from the company. Success with the free affiliate referral program business that each member automatically receives at no charge from the Internet Marketing Mentoring And Coaching Center (www.iMMACC.com) is all about the movement and distribution of product, which includes internet marketing tools products and other product resources. The Affiliate member understands and agrees that, in order to receive commissions under the www.iMMACC.com compensation plan, he/she must first buy the product themselves before they can promote the product themselves and make personal product referral sales. Sponsoring members into the company may only occur when a prospective member purchases the Total Marketing Program product. Members who participate in the optional affiliate referral program must then help their new members make retail sales themselves (as outlined on the Company Web site). Commissions are based solely upon the movement of the Total Marketing Program Product Packs & sales generated from each member's online retail store. Member affiliates are not qualified to derive income until they personally consume & use the products themselves. The only commissions that are paid out are affiliate referral program program commissions for the sale of the actual Total Marketing Program Product Packs. iMMACC.com does not sell a business opportunity - and the affiliate referral program business is free to all existing members who have first purchased iMMACC.com products themselves. All member affiliates must be of legal age to enter into binding agreements in the state or province or country in which they reside. All member affiliates agree that they are solely an independent contractor, responsible for determining their own business hours, activities and that they are not an agent, employee or legal representative of www.iMMACC.com. (herein after referred to as the Internet Marketing Mentoring And Coaching Center or the Company). Member affiliates will not represent or imply in any manner that they are an agent, employee, or staff member of the Company. Member affiliates are solely responsible for the payment of all federal and state/provincial self-employment taxes and any other taxes, including any type of goods and services taxes, harmonized sales taxes, or other sales taxes, that may be required under any federal, state/provincial or regulatory taxing agency in the country in which they reside. 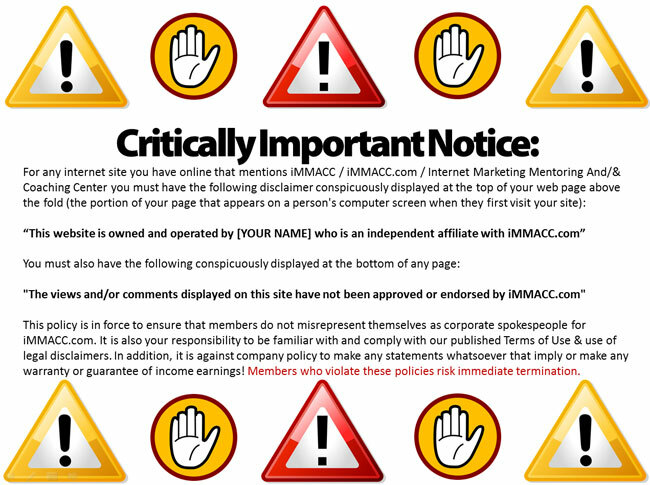 The member affiliate acknowledges that the iMMACC.com registration procedure does not constitute the sale of a franchise. Furthermore, no commission able fee nor purchase is required for participation as a www.iMMACC.com Affiliate Referral Program member. Participation in the iMMACC.com affiliate referral program is a free option for active iMMACC.com mentoring students only. An active iMMACC.com mentoring student is any individual who maintains their current $99.97 monthly mentoring fee. In order to maintain a viable Marketing Program and to comply with changes in federal state or local laws in various areas, www.iMMACC.com may from time to time modify, at it's sole discretion, any policy, procedure, practice, methodology in place at the time any prospective affiliate member executes this agreement. Therefore, this Agreement shall be deemed in effect upon its receipt and acceptance by www.iMMACC.com. Such alterations shall become a binding part of this Agreement upon publication on the official www.iMMACC.com Affiliate Web site, publication in any company materials in written and audio format. All member affiliates understand that no attorney general or other regulatory authority ever reviews, endorses or approves any product, compensation program or company, and every affiliate member agrees to make no such claim to others, or they will face immediate termination and possible legal repercussions. While the earnings potential with the free affiliate referral program with the Internet Marketing Mentoring And Coaching Center can be significant, all member affiliates acknowledge that financial success in any affiliate marketing business endeavor requires that the individual treat their affiliate marketing business like a business, demonstrate a consistent & diligent work ethic, continuously educate themselves, and make every effort to acquire online and offline marketing skills. There is a substantial learning curve required of all member affiliates who wish to master online and offline marketing methods, tactics and strategies. iMMACC.com sells a Mentoring Program Product that can be used by anyone to market any product or service online. Any member may sell, assign, or transfer their position provided they have prior written approval of the company and have paid a one time $99 position transfer fee to Conasia Global Internet Inc. Your position may also be willed to your heirs provided all monthly fees and annual renewal fees are kept up to date. A letter from your attorney addressed to the company is required to make that happen. The Internet Marketing Mentoring And Coaching Center (a division of ConAsia Global Internet Inc.) doing business as The Internet Marketing Mentoring And Coaching Center and www.iMMACC.com (formerly Big­TicketToWealth.com). Do not, under any circumstances, register with iMMACC.com (Conasia Global Internet Inc,) unless you fully and completely agree to & accept each and every single one of the terms outlined on this web page, especially Point 7 dealing with No Money Back. Copyright (c) 2007-2013 by the Internet Marketing Mentoring And Coaching Center (a division of ConAsia Global Internet Inc.). All rights reserved. Last revised September 9, 2010.